Imagine a fairytale-like medieval village built on a peninsula of land jutting out into the middle of a beautiful crystal-clear lake, surrounded by mountain peaks, their tips blazing with the fire of the setting sun. You are not the first to imagine such a dreamlike village. In fact, this romantic a village was not only dreamt of, it was brought to life almost 2,000 years ago and it is still here today as one of the most beautiful sites in all the world for your one-of-a-kind wedding. When you marry in Sirmione you are following in the footsteps of lovers for more than 2,000 years. The village is the medieval town of Sirmione on the south shore of the romantic Lake Garda, an area which has inspired artists, writers, poets and lovers for as long as love and poetry have existed. Many of the ruins of this town date back to the 1st century and the Scaligeri Castle, built in the 12th century, is one of the best-preserved castles from that period in the world. The spas of Sirmione are known the world over. What has drawn so many people to this Eden-like spot is more than just the breathtaking views and the clear mountain air and sparkling pure water. Lake Garda is the caldera of an ancient volcano and Sirmione is blessed with several natural hot springs. From ancient times to the present, Sirmione has been a natural spa, a place of rejuvenation and new beginnings. 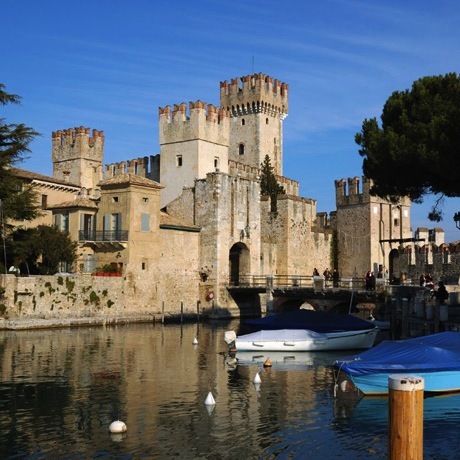 If you are looking for one of the most pristine and ancient sites in which to hold your wedding, you could not choose more wisely than the village of Sirmione. Its ancient and winding cobblestone streets, its many ruins and unsurpassed views exist side-by-side with 5-star hotels and gourmet restaurants. Your civil ceremony can take place in one of the castle or palace wedding halls available in the area or you can choose to hold a religious blessing or symbolic in one of the stunning 5 star villa hotel gardens. Your wedding planner can make arrangements for a Catholic ceremony at one of the ancient and ornate Catholic churches or a Protestant or Jewish wedding may be arranged at any number of stunning Villas or hotel ballrooms or gardens overlooking the serene beauty of Lake Garda. Symbolic weddings can be celebrated at almost any romantic location. Following your wedding your reception will be held at the hotel or restaurant of your choice, with gourmet Italian food and the best wines that Italy has to offer. If your dream has been to have an elegant wedding on the shore of an unspoiled lake, with sun-touched mountain peaks reflected in its mirror-like surface, then do yourself a favor and make plans today to hold your wedding in the ancient and romantic town of Sirmione.